Arthritis of the hand is a very common condition, and therefore there have been many solutions developed to help patients with hand arthritis cope with their limitations. One common problem is writing. Is that true for you? When you grip the pen firmly enough so that your handwriting is legible, does your thumb base ache and you have to limit your writing? Relax! There are many options to help keep you writing. I feature here some of the options just to show you how much is out there. But don't consider the options limited to just these, go out and see what is available in your area. If you find a great one, let me know! They are not expensive, typically costing $8 or so. Also, don't consider a listing here as an endorsement. I have only used one, and I don't have arthritis (yet!). One simple trick my friend Dr.Charles Eaton has suggested is to hold the pen or pencil between the index and middle fingers, with the thumb either in the palm or against the index proximal phalanx. No adaptive devices needed, small diameter pen works fine. Dr. Tom Fischer has suggested using "roller ball" pens that do not require any large contact force between the pen and the paper also work well: "I like the slightly fat, textured, roller ball that the ink just drools out of as you write yet doesn’t leak on a plane when the pressure drops, or when it is shaken around"
There are many other aids for other activities, such as turning a key. You can learn more about the range of activities for which aids have been developed by speaking to your certified hand therapist. I usually use Hand Therapy of Marin, because they are good and friendly, and because they are nearby. 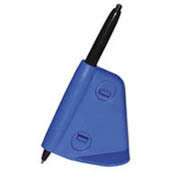 The simplest solution is to put a triangular or spongy rubber slider onto your pen. 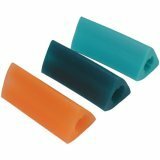 It increases the diameter, changes the shape from round (hard to control) to triangular, and the sticky rubber is easier to control with less pressure than a smooth slippery plastic surface. These are sold in almost all office supply stores. You can also find substitutes for these at the hardware stores. Look for the insulation around hot water pipes or air conditioning lines. 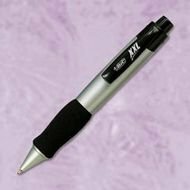 This pen is the Bic XXL, which has many of the features that you should look for in a pen: soft, sticky rubber where you need to grip it plus a larger diameter. 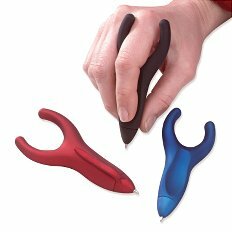 Both features allow you to control the pen without having to grip so hard. This will definitely decrease the stress on your arthritic joint. This is the Pilot Dr. Grip. It has the same features as the BIC XXL and is the one I use in the office. It is easily available at many stores, I get mine at Office Depot. The refills run out fairly quickly it seems to me, but I just keep a store of them in my drawer. This pen uses a somewhat similar approach to control, using a complete hole that your index finger can go through. It is available from Amazon. This pen is the Steady Write which takes yet another approach. The base of the pen is flat and sits on the page. 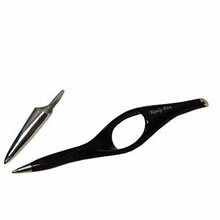 You do not have to control the angle of the pen, just the position. It is sold by the Active Forever Company. This pen is the ArthWriter and it takes a very different approach. It might be more appropriate for patients who have involvment of many joints and cannot bring their index or middle fingers to touch their thumb tip. 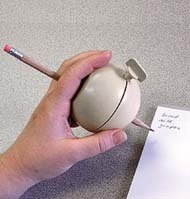 The way the ArthWriter is used is you take your favorite pencil or pen, insert it into the hole, and hold it in place with the screw (seen to the right). 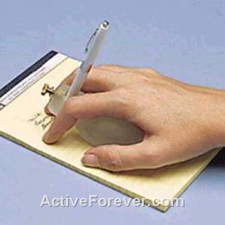 I found several Internet sites that sell the ArthWriter. Just use Google to search for it. Here is the Amazon page that features it. This is the Writing Bird, which allows you to use the whole hand but not forcefully. It is sold by the Active Forever Company. Remember my warning at the top of the page: I have not used most of these and am not listing them as an endorsement. I am putting them here so you can see the range of options that are available to you, and to inspire you to not accept your arthritis as a limitation, but as a challenge to be managed. Stay active!